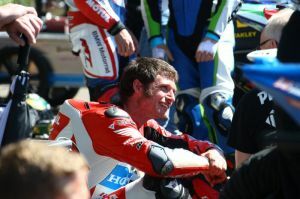 Honda Racing will not participate in today’s six-lap Senior TT with Guy Martin, bringing an end to a fortnight on the Isle of Man in which poor weather severely limited on-track action. Honda Racing will now continue its preparation for the Southern 100 and Ulster Grand Prix with the CBR1000RR Fireblade SP2. We’re disappointed not to be taking part in today’s Senior TT, a decision that is ultimately due to a lack of track time for Guy on the Fireblade. We came here to race and everyone in the team – who have worked extremely hard over the last few months – was looking forward to seeing what the new bike could do. Guy informed me that he wouldn’t race in the Senior, which is a tough decision to make but one I can understand given the lack of practice we’ve had. The good news is that Guy has told me that even though the TT hasn’t worked out, he’s keen to take part in the Southern 100 next month and try to get the most from the Fireblade there. We wish a safe race to all the competitors and teams involved. I came back to the TT this year to race and try to win with Honda Racing. I’ve done loads of testing and the team have been flat out, before we got here and at the event. But we’re not doing the times needed to be competitive here, we need more time to set up the bike and doing six laps will not achieve what we set out to do and I’ve always reckoned this is not the place to be out riding just to make up the numbers, so as a team we agreed it wasn’t right competing in the Senior TT. With the weather and my crash I’ve done plenty of tea drinking and dog walking. I’m looking forward to racing the Mugen, it’s a real honour to race the most interesting bike in the paddock. I’ll see how I can do and I’m looking forward to then getting back to work Monday.